Bearings operating in high temperature applications can be unreliable due to premature failure. The result is high costs and time wasted on frequent bearing replacements. 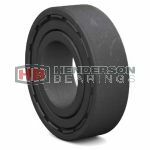 These bearings designed to reduce maintenance, run longer and cleaner in high temperature applications. High temperature bearings incorporate a graphite-based lubrication that continuously lubricate the bearing, eliminating the use of grease and oil. Ideal for applications in industries such as metals and food & beverage, these bearings are designed for trouble-free operation at temperatures up to350 °C (660 °F).